• Jaron Lanier is the author of You Are Not a Gadget and “father of virtual reality” considers whether writers and “content” creators can make a living in the Digital Age. As paper and ink give way to electronic gadgetry, questions arise. What will reading be like in the future? Will long-form prose survive? Will the quality of literature get better or worse? 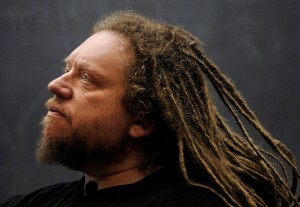 To Jaron Lanier, those are the wrong questions. Earlier this year Alfred A. Knopf published Lanier’s manifesto, You Are Not a Gadget, in which the musician and digital technologist — famously known as “the father of virtual reality” — attempts to reign in some of the euphoria over Web 2.0 with a sobering analysis of its darker implications for the future of authorship, individuality, and the socioeconomics of creative work. We caught up with Lanier recently with a list of questions. We wanted to hear his views on a variety of topics centered around the emerging technologies and their effect on books and publishing, but throughout the conversation Lanier kept returning to a single issue: whether writers and other “content” creators will be able to make a living in the Digital Age. Popular Internet culture, said Lanier, offers creators a fool’s bargain: “We offer people fake flattery in exchange for them impoverishing themselves.” He wants a system in which creative intellectual workers of all types — software designers, scholars, journalists, artists — are paid for their work. DISCUSS: Is Writing for the Web a “Fools Bargain”?